How much to advertise on YouTube Masthead in Malaysia? How to and how much to advertise on YouTube homepage for a day? The cost per impression and reach are quite attractive for advertisers with nationwide reach. You might be asking, how do I advertise my video at YouTube homepage? Well, there is no way you can target your video ad at such placement by using self-service Google Ads (auction method). The answer is, you need to reserve and book manually via a digital marketing agency or with Google directly. Read on to understand more about this ad format. The ads at YouTube homepage is known as YouTube Masthead technically, which is usually booked for country-wide reach with a 24 hours slot. In layman terms, this is like a digital billboard which you can book for a day at YouTube, to be shown to every Malaysians who log onto YouTube on that particular day. This is how a masthead ad looks like on a desktop browser, captured on YouTube Malaysia homepage during 20 January 2019. Engagement panel is where you can place your banner and call-to-action button to your landing page. This is how YouTube masthead ad looks like on mobile (YouTube app). If you notice from the screenshot above, the only difference is that the engagement panel does not appear on mobile devices. 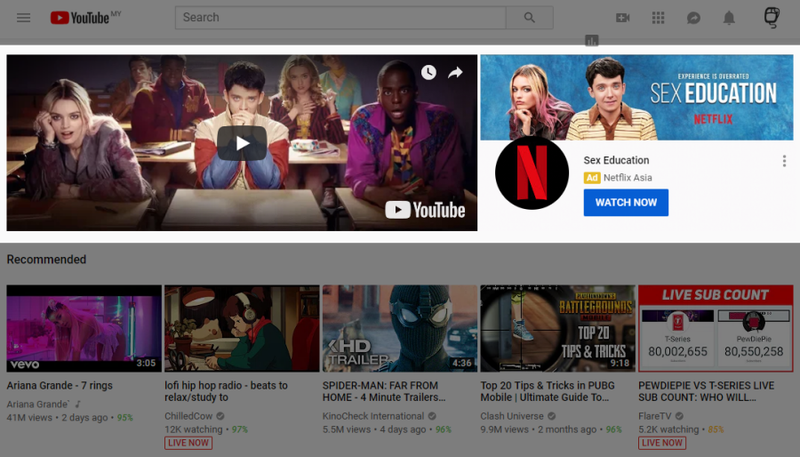 Just go to YouTube.com and see for yourself which Masthead ad is featured today for your country. As mentioned earlier in this article, YouTube Masthead cannot be booked via self-service, auction-based Google Ads (previously known as Google AdWords) platform. YouTube Masthead has to be reserved manually by the country and the day you wish to advertise, but do take note that it is best to book the date earlier as there is only one advertiser per day. According to Google, dates during the festive season or big shopping events are very popular and sold out very much in advance. 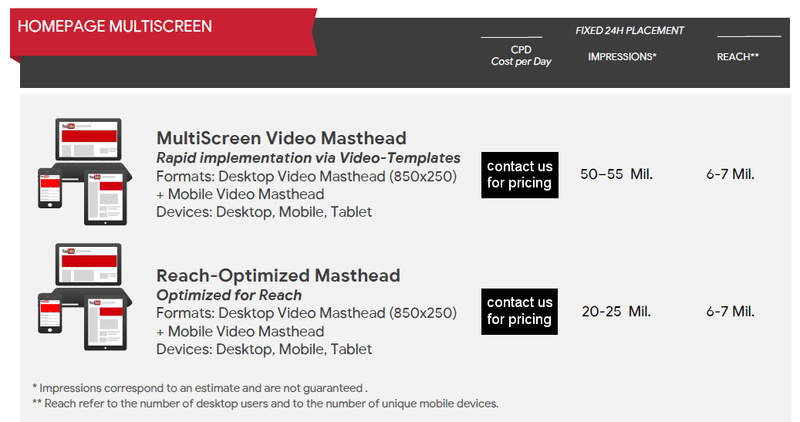 The cost of YouTube Masthead booking goes by day basis, and we are seeing the price increases every year with more reach and more demand (by advertisers). Due to its wide targeting, the CPM (cost per 1K impressions) and cost per reach offered by YouTube Masthead are quite attractive for advertisers. Having said that, YouTube Masthead is only suitable for brands with nationwide reach. If you are interested in targeting certain segments via selected content topics or languages, you can consider Prime Packs with higher CPM, via reservations too (with a minimum booking volume). Feel free to contact us for YouTube Masthead or Prime Packs pricing, just don't expect to book Masthead or Prime Packs with anything less than RM65,000. Silver Mouse: How much to advertise on YouTube Masthead in Malaysia?